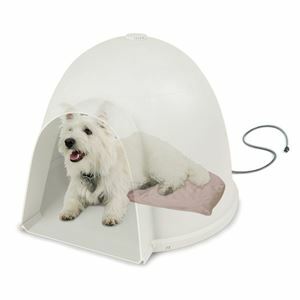 K&H Pet Products Lectro-Soft Igloo Style Bed Small Beige 11.5" x 18" x 1.5"
Round, or dome shaped doghouses have been a best seller for years and the Lectro-Soft Igloo-Style Heated Pad is the answer to provide warmth for the animals using these homes. Its half round shape fits easily through the door of the home and allows for the pet to stay on or off the heated surface. Dimensions: 11.5" x 18" x 1.5"